Imagine a material combining the beauty of natural stone... with the strength and resilience that only today's technology can produce. Our skilled artisans handcraft every one-of-a-kind piece from specification to finished product. and a joy to use. Consisting of natural stone, Dolomite (approximately 74% material composition), Terephthalic resin (approximately 24% material composition) and proprietary components (approximately 2% material composition), TERE-STONE® is cast with an "NPG" Isophthalic get coat system. While having a gel coat normally invokes a negative reaction, Taylor's gel coat system is an integral component to the base material and is resistant to stains, burns and abrasions. 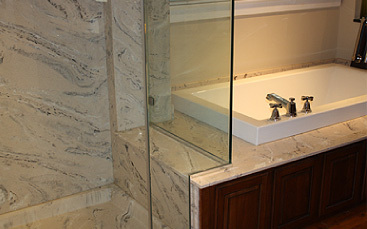 Scratches can be easily removed simply by buffing and polishing the surface. 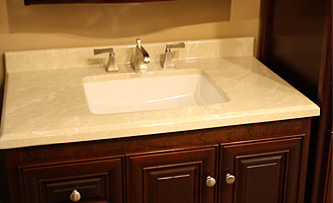 With a material composition and consistent color throughout the base material, similar to solid surface products, damages to the surface can be repaired utilizing a consumer-friendly patch kit. TERE-STONE® is frequently compared to more recognized solid surface products, such as Corian and Swanstone, quartz products, such as Silestone and CaesarStone, and natural stone products, such as granite and marble. While some similarities exist with all these products, TERE-STONE® compares to none of them and is actually a stand alone product. 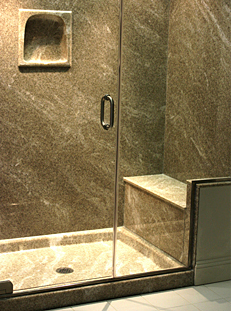 While the color palette is comprised of shades and tones which may be similar to other products, the exclusive selection of colors known as Sierra Series™, truly distinguishes TERE-STONE® from any other product on the market, creating the look of real stone, yet more durable than granite or marble.